If you have not heard of Flo, let us introduce her. She works in restaurants, trying to help customers with their orders in a timely fashion. Like customers found anywhere, they like to challenge her smile with their order changes and requests. Flo also has friends that work in hair salons and pet grooming location. The latest challenge, Cooking Dash, Flo is working at a Theme Park. She has three different food stands to work at, each with their own thrills and spills. This particular Flo game has 30 levels so it isn’t a quick one to get all the way through. Depending on your ability to plan ahead and change that plan as things get thrown at you, will mean if this is a game you play for a week or months. 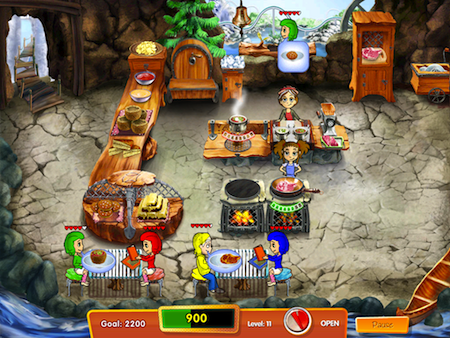 As long as no one throws a hot dog or burger at you, there isn’t any violence so Flo in Cooking Dash can be enjoyed across all ages of family members.